Bomb detonated on security fence in northern Gaza, no injuries or damage reported. An explosive charge was detonated by Gaza terrorists on Thursday night, targeting IDF forces in the area. The bomb was placed on the Gaza security fence, in the northern area of Gaza. No injuries or damage was reported as a result of the attack. 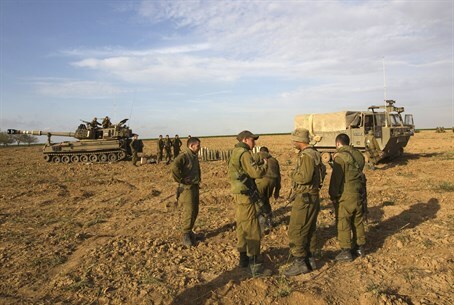 Earlier on Thursday, the IDF uncovered two explosives near the border in southern Gaza. IDF forces neutralized both bombs before they could cause any harm. Just last Monday, terrorists in Gaza fired a salvo of seven rockets into southern Israel, one of which narrowly missed a synagogue packed with worshippers in the city of Sderot. Two of the rockets landed in Sderot, which lies on the border with the Hamas-controlled territory, as hundreds of worshippers were gathered for the final day of the Jewish festival of Passover. Miraculously no one was hurt, although police said in a statement that a road in a residential neighborhood was damaged.